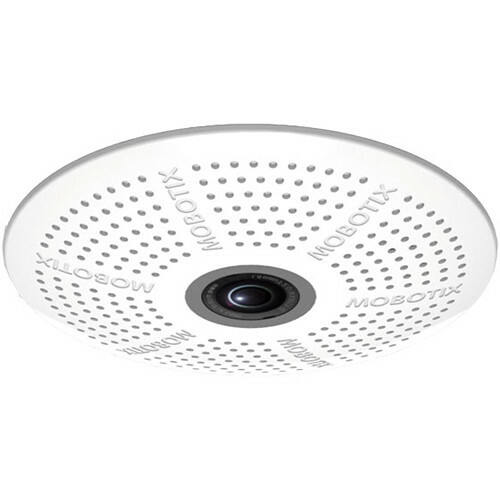 The 6MP Hemispheric Mini Dome Camera from Mobotix is designed for use in retail settings, exhibition areas, and public premises. It can be installed in a drop ceiling, and it features a compact form factor for unobtrusive surveillance. Furthermore, when mounted directly above a cash box, the camera can provide detailed video of the box's contents, and it allows you to read small writing, like the serial numbers on bank notes. The camera uses a 1.1/8" CMOS sensor for up to 6MP (3072 x 2048) resolution, and the 1.6mm fixed lens provides a 180° x 180° horizontal field of view for a wide coverage area. There is a built-in microphone and speaker for 2-way audio, enabling you to speak and listen to those you are monitoring. Additional features include analytics such as motion analysis, heat maps, and counting corridor reports. The camera's built-in temperature sensor, shock detector, illumination sensor, and MxActivitySensor all trigger an alarm for event management. Additionally, backlight compensation and automatic white balance allow you to take detailed images in ambient lighting, and image distortion correction and panorama correction enables dewarped pictures in all formats. An integrated microSD slot provides edge storage, and the package comes with a 4GB microSD card for immediate recording. The camera features an RJ45 Ethernet connection with PoE technology for a minimum of cables during setup, and there is a mini USB interface for easily transferring data directly to a computer or NAS. Hemispheric distortion correction takes place in the camera, drastically reducing the amount of image data and bandwidth that needs to be transferred and saved. Designed for use in retail, exhibition areas, or public premises, the camera provides object counting and automatic heatmap reporting. Additionally, people behavior can be defined as an event trigger. Activity-controlled, software-based image analysis function detects movement of people and objects in a monitored area, for reliable results in applications with large amounts of external interference. It can distinguish between movements of vehicles, people, or objects that trigger an alarm and movements that are not relevant to alarms, such as shadows, changes in illumination, or trees swaying in the wind. By defining recognition zones and counting corridors, the camera can collect statistical behavior data on people and objects. MxAnalytics can be activated and deactivated manually, based on a signal, or following a timetable. The results are saved in the camera every 15 minutes and can be exported manually or at specified times. Box Dimensions (LxWxH) 7.1 x 5.7 x 5.3"